We did not start Speedster of the Month until February. So, here's a picture of my 866 to fill this space. 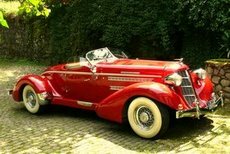 This Original 1935 Auburn 851 Speedster belongs to Gregory Ornazian from Rochester, Michigan. 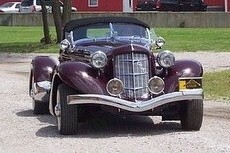 A Glenn Pray 866 Speedster. 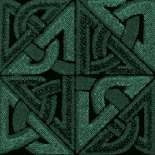 It is Owned by Felix DeGeyter, Broken Arrow, Oklahoma. This Elegant Motors 856 Speedster is owned by Kevin Marshall from the United Kingdom. 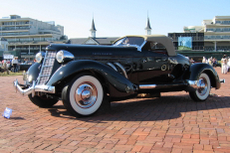 Robert Douglas owns this Very Nice Factory Built Glenn Pray 866 Auburn Speedster. Sonny and Sandy Burrow are quite pleased with their Glenn Pray Auburn 866 Speedster. 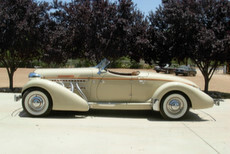 Sam Ross of Acton, California owns this Auburn 856 Speedster. It was produced by Elegant Motors. 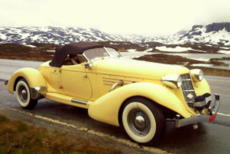 Jari Turunen from Finland is the Proud Owner of this Classic Cars of London 886 Speedster. 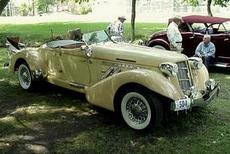 This Elegant Motors 898 four place Speedster belongs to Kelly and Cecelia Cecil. A very Nice Car. Arvid Munthe from Norway enjoys Touring in his 866 Auburn. Pictured on the Haukelid Mountain pass. Peter Jaeger from Germany owns this Corvette powered Auburn. A very authentic looking Speedster. 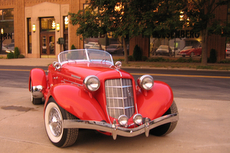 Jim Kostakis from Missouri is the original owner of this 866 Speedster built by Glenn Prays ACD company.